I saw a meme once that said "My only goal as a mother is to raise children that don't have to recover from their childhood" and it really resonated with me as I am in the continual process of recovering from mine. I wish trauma wasn't part of my background, but knowing its far reaching effects first hand has guided my parenting choices for the better, in a "do almost every thing the opposite" kinda way. I don't think I'm at the point of being thankful for being fucked up, but I might get there one day. When I had my breakdown earlier this year I was conscious of not scaring (and scarring) the kids, but also letting them know what was happening. They're not stupid. Kids can tell something is up no matter how hard you try to hide it and it just makes everything uncomfortable; an elephant in the room that everyone is deathly afraid to mention. I let them see me cry a few times because what message am I sending them if I say its OK for them to cry but not me? We sheltered them from the big, ugly stuff, but I let them know that yeah, mum's sad right now. I needed them to hear that it was nothing they did that made me sad, and that I was taking some medicine to help my brain the same way that Tricks takes medicine to help his lungs. They were allowed to ask me anything and I would answer as honestly (and age-appropriately) as possible. Tricky had some questions, but Bobbin is too young right now and was just happy with cuddles and tickles. 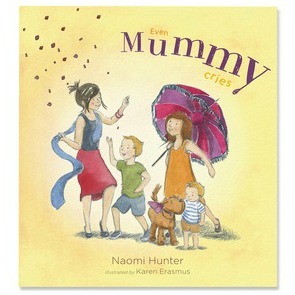 One of the resources I've used recently is the book Even Mummy Cries by Naomi Hunter (available through Empowering Resources). It is a great starting point for an important conversation. It alludes to mental illness, but never uses the specific words, so it could be helpful with a range of mental diagnoses (although Dr Glow is suspecting the mum in the book is bipolar). When it showed the Mum sleeping a lot, Tricks was all "that's what you did!". He was able to recognise the behaviours of the Mother and see himself in the children and I think it helped him to know that it wasn't just his mum acting all strange. The book, with its beautiful illustrations by Karen Erasmus, will let you ease in to talking about big feelings and how they influence our lives, whether you experience mental illness or not. They'll be learning acceptance without even knowing it. It's the literary version of smuggling veggies in to spag bol. With these frequent, small discussions about mental illness I hope my kids grow up knowing it's nothing to be ashamed of, scared of, or hidden away. That they understand their Mum's mental illness, and that of others, is just as real as diabetes or broken bones. Basically I don't want them to grow up to be assholes who carry on the stigma. 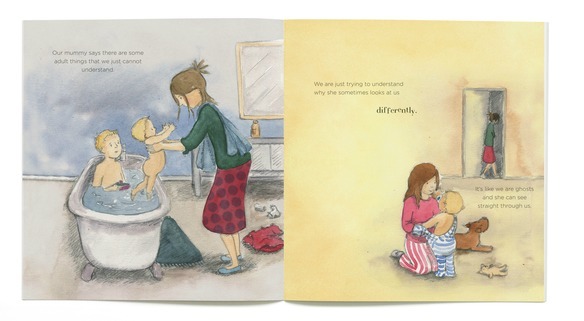 I believe that being open and honest with kids is important, so we have read the other books from Empowering Resources too, A Secret Safe To Tell a gentle story that covers body safety, and You're Different, Jemima that encourages kids to celebrate their differences. 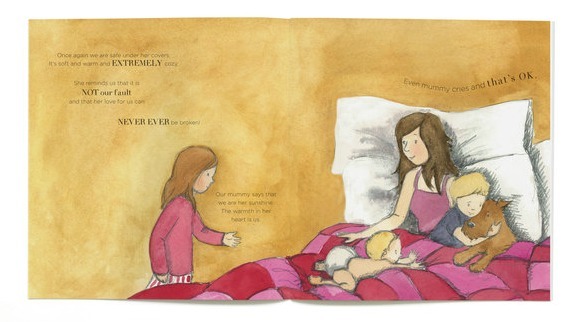 But Even Mummy Cries is the one that seems like it was written for us, so I have a soft spot for it. How do you approach the big conversations with your kids?